Afghanistan has been the focus of significant international humanitarian, development and reconstruction investments over the last decade. 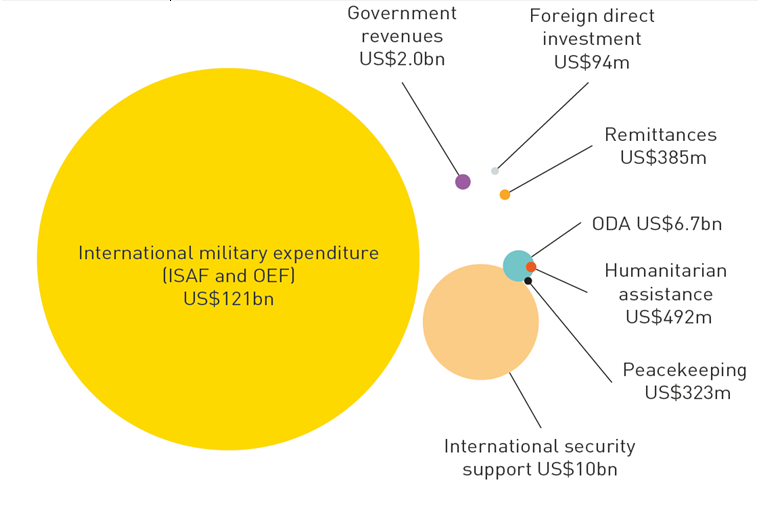 Despite this, a snapshot from 2012 shows how international assistance, domestic revenues and other investments are still eclipsed by military and security expenditure. International military expenditure through the International Security Assistance Force (ISAF) and Operation Enduring Freedom (OEF) dropped to US$121 billion in 2012 from a high of US$129 billion in 2011. Nevertheless this figure still eclipses the US$10 billion provided in international security support for the Afghanistan national security forces in 2012. In turn, total international security support is roughly equal to the combined total of all other licit resource flows in the country (including government revenues, remittances, foreign direct investment, official development assistance (ODA), humanitarian assistance and peacekeeping). Looking ahead the picture is likely to remain unchanged in the coming years. The signing of a bilateral security agreement with the US and Status of Forces Agreement with NATO* indicates that there will be continued international military and security expenditure at least over the short term. The nature and scale of future international assistance, however, remains unclear. Despite development and security improvements, on the eve of the ‘Transformation Decade’** rising inequality, insecurity and human vulnerability to crisis underline the importance of recalibrating external assistance taking into account the various resource flows in order to protect the fragile gains. Government revenues are unlikely to grow until greater stability is secured. The GHA report Afghanistan beyond 2014: Aid and the Transformation Decade focuses on the trends and scale of three flows of international spending over the past decade – humanitarian, development and security – as well as detailing the economic situation and outlook. There are a number of overlaps in the resource flow circles. The size of the overlaps does not correspond exactly with the overlap in resources but are estimates. The main assumptions are that the majority of humanitarian assistance will be included in ODA; a percentage of peacekeeping can also be reported to the OECD DAC as ODA; a proportion of international security support (which includes contributions to the Afghanistan Security Forces Fund and the Afghanistan Law and Order Trust Fund) may also be included within reported ODA. * The bilateral agreement with the US will preserve a US military force in Afghanistan until at least 2015. The Status of Forces Agreement with NATO for training of the Afghanistan National Security Forces will allow between 4,000 and 5,000 additional NATO troops to remain in Afghanistan after 2014. ** The Transformation Decade runs from 2015 to 2024 and is a period in which Afghanistan will move to consolidate its sovereignty. A strategic consensus known as the Mutual Accountability Framework (MAF) will form the basis of the partnership between the international community and Afghanistan. The figures used are from 2012, the latest year were comprehensive figures are available.